Image from a disc compiled by Derick Pearson and many thanks to Jim Hebden for such definite information. I doubt whether you would have been to this event. 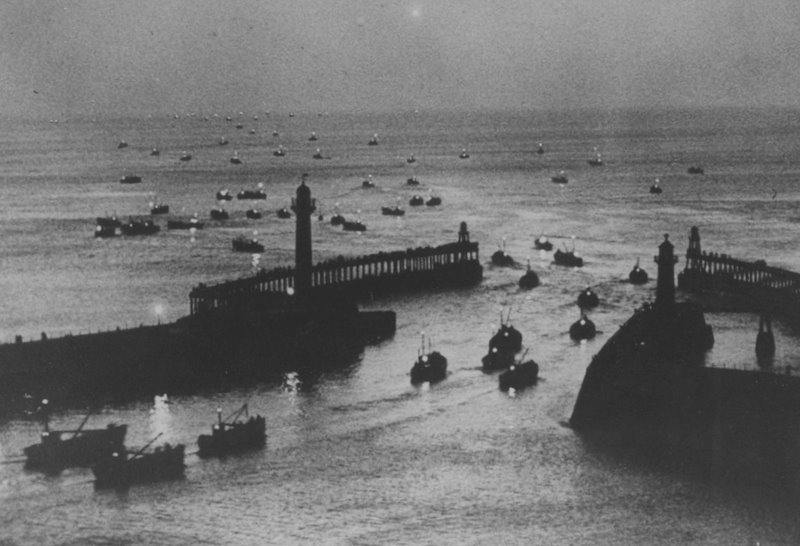 I was informed when I collected the photo many years ago that it was the Herring / Fishing fleet leaving Whitby early in the morning around the turn of the century c1900.This would of course need confirmation. It must be a bit later than 1900 as the picture shows the breakwaters which were added to the existing piers about 1914. Also ,though in no expert on boats. Are they not diesel boats as there are no sails or funnels fo steam boilers? The photo looks very 1950’s to me. The photo of the herring fleet was taken on an evening in the 1950s and the boats going out were ring netters, thay work in pairs and shoot their nets around the school of herring in a ring, so surounding the herring. When this photograph was taken I would still been of school age; when I left school I became a fisherman and in the summer months we went herring fishing. This image is very similar to one I recall as a child taken in the early 1900’s by Edmund Hall then the staff photographer of the Whitby Gazette. I believe it once appeared as the front page of a Whitby Tourist guide. His photo was taken from up by the abbey and had the reflection of the moon on the water over the departing herring fleet, very similar to the water colour by John Freeman. I have tried in vain to find the photo. To declare my interest Edmund Hall was my great grandfather. It was reported in the Whitby Gazette article on the occasion of a dinner to mark his 60 years at Horne Bros in 1931 that he was responsible for the greater part of the photographs that had appeared in the Gazette over the last 30 years i.e. from 1900 onwards.